Artist Paulina Cassidy creates her work mainly using watercolour, ink, and watercolour pencils. Her influences include books, films, theatre, dance, music, ghosts, animals, botany, ocean life, holistic healing, dream imagery and the Victorian era, all of which are evident in the Paulina Tarot , a whimsical, eclectic mix of symbols and images. 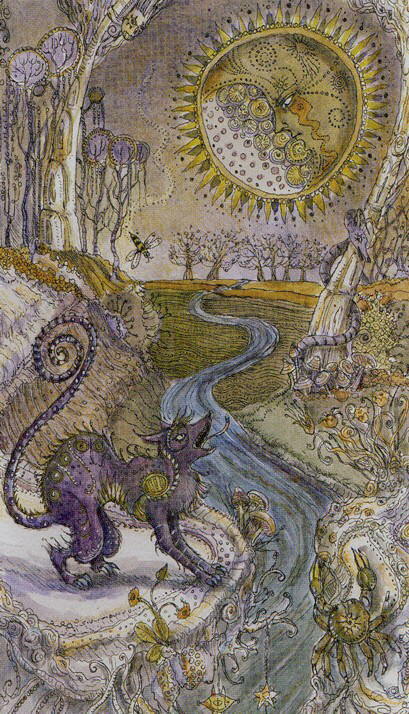 The Moon is an eerie detailed otherworldy card, with a river running through it, back towards a grove of trees. To one side, on the bottom of he card, we see a purple hybrid creature baying at the moon. Look closely, and you will see a crayfish emerging from the water. A snake is winding itself around a tree on the right hand side of the card. The face in the moon appears to be all seriousness.